Running since 2006, the Performance Driver ‘Track’ Day for groups of up to 6 members from a car club, has been enjoyed by hundreds of individuals. 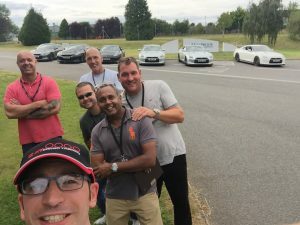 Modelled on attendance at a track day, the itinerary is an advanced driving course providing an introduction into performance driving with 1 hour 40 minutes driving time across the day. All in the company of your dedicated instructor. Whilst waiting your turn there is plenty of opportunity to chat with your fellow car club member, how amazing your brakes are, whether an upgrade with the latest mod would add benefit and/or horse power or compare notes on your surprise at what you and your car are capable of without spending thousands of pounds. We are proud to work with the following car clubs: 350z-uk, Mitsubishi Lancer Register; GTROC; nissansportz; M3 CSL Register; AAOC; The Lotus Forums; Hangar 111; Seloc; 911uk.com, GT86 Owners and Drivers Club, Petrolhead Nirvana, Baby BMW and AWSC car club. Please contact Jo in the office on 01234 757633 if you would like to look at holding a car club training event. Find out what Erol from GTR.co.uk thought of his first car club experience with CAT in the video below. If you would like to join one of these events give Jo a call on 01234 757633 to check on availability.